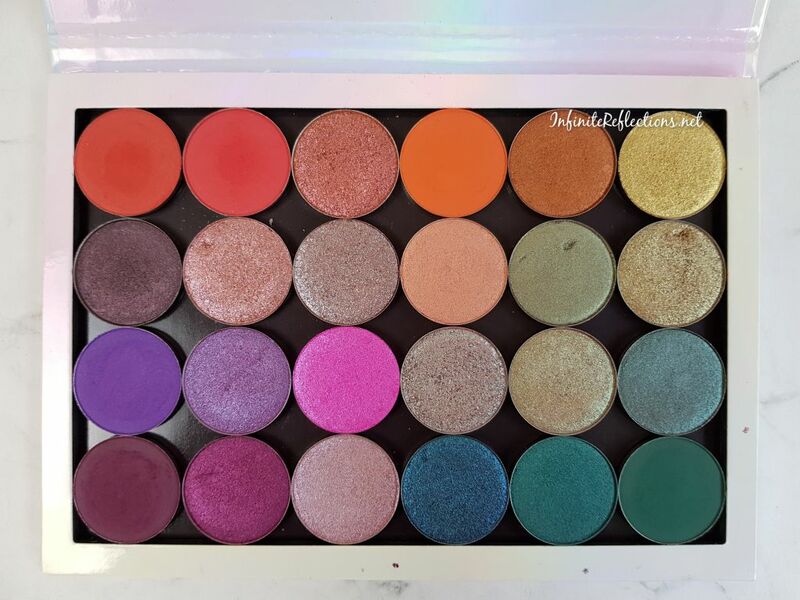 It is so much fun to mix and match different shadows to create a custom palette which is unique to one’s personal taste. 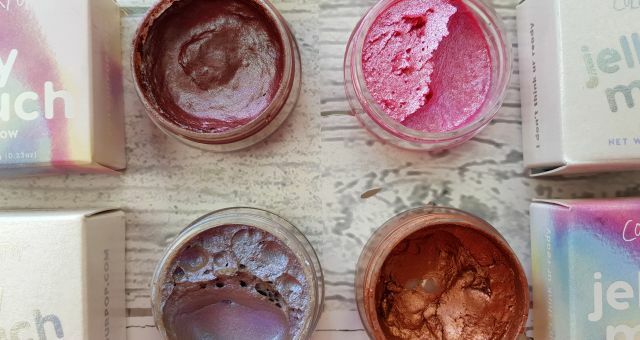 I think I can finally appreciate all those bloggers and vloggers who have stacks and stacks of eyeshadow singles. I don’t intend to have stacks but I am currently enjoying curating my single eyeshadow collection and I do have a definitive goal in my mind. 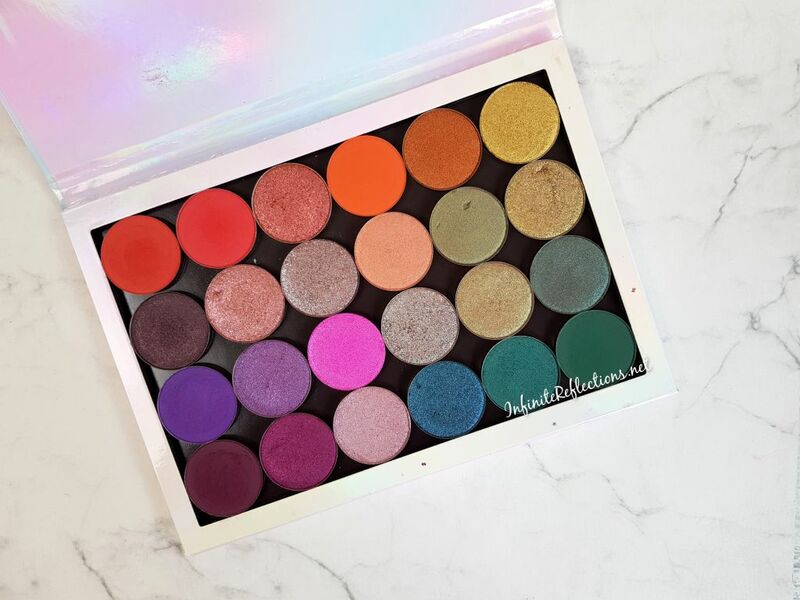 In this post, I will be sharing the 24 single eyeshadows which I picked up as a part of their “Build Your Own Palette” promotion. This promotion is not available all the time but the singles are. So, these singles you can buy anytime individually. But, I will highly encourage you to keep track of their Instagram to know when is the next “Build Your Own Palette” promotion is coming. They do give a handsome discount on the entire palette. 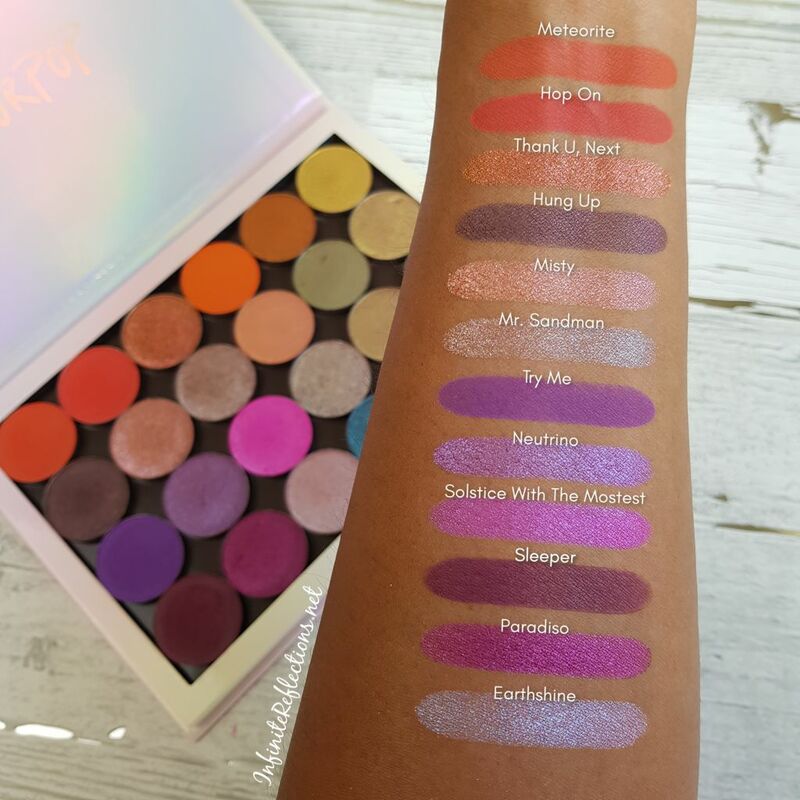 I purchased the 24 eyeshadows palette and chose 24 eyeshadow singles of my choice to fill up the empty palette. The entire bundle along with the palette costed me less than $50, instead of more than $100. So, I got these singles at a great deal and also got the palette to store them. So, I will highly recommend this “Build Your Own Palette” concept. As I already mentioned, the singles can be bought individually as well. The cost of each single is $4 for just the pan and $5 if you want to buy it in a compact form. Each pan contains 1.5 gm /0.05 Oz. of product. 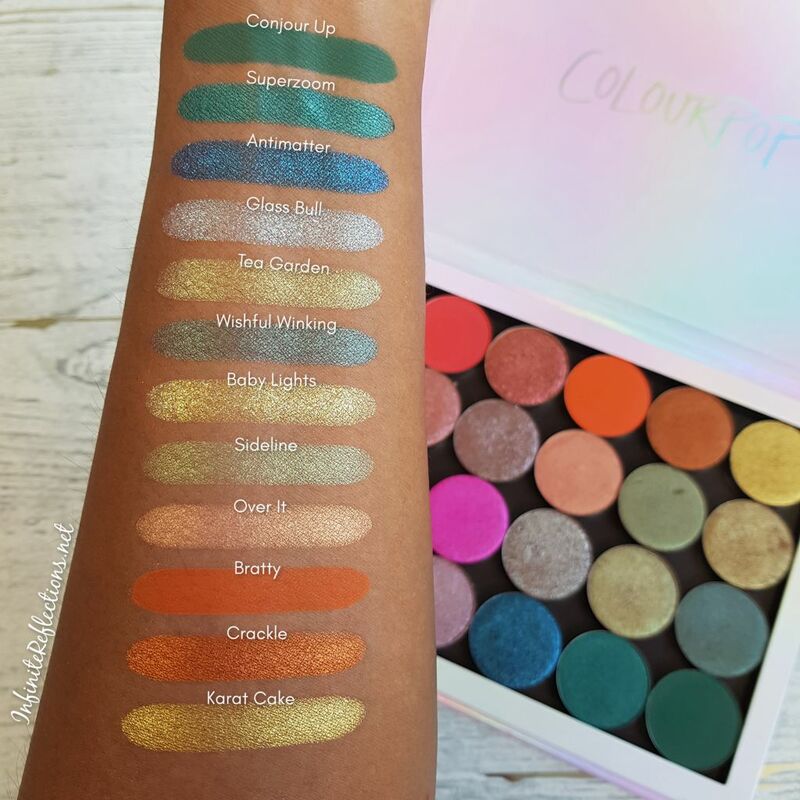 I love colourpop shadows and usually have a very good experience with the majority of them. We get excellent quality in terms of pigmentation, blend-ability, colour payoff, texture and at a very good price point. I may face issues with some shadows here and there but I have been able to make all of them work for me so far. Some shadows are really soft and there could be fallout but its not a big deal breaker for me. Now, let’s take a look at all the shades I got and my quick thoughts on all of them. Here is how my palette looks like. I picked up just a few matte shades of red, orange, purple and green as I already have some colourful matte palettes that I love. 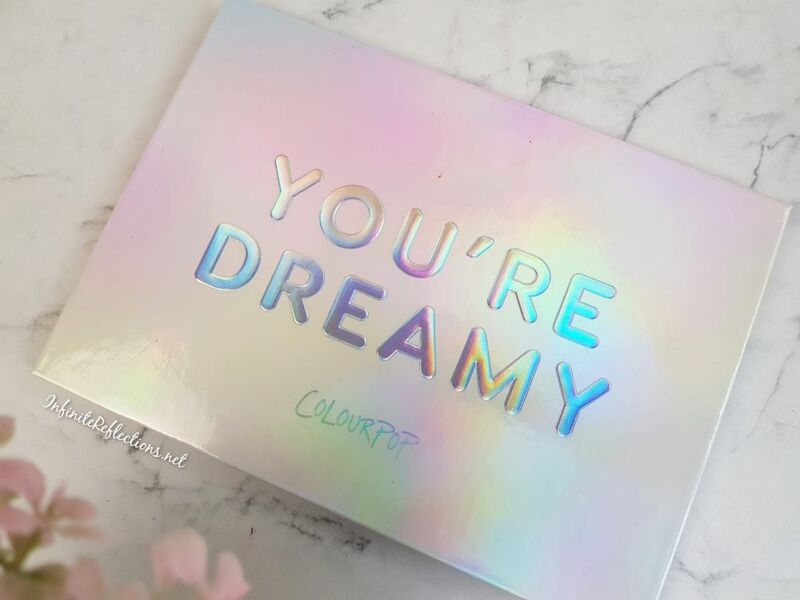 The majority of my palette consists of shimmers and duo-chrome shades. I love shimmer, metallic and duo chrome shades so I thought it will be fun to fill the palette up with these finishes. I have got a variety of shades and I am really happy at the end product. Meteorite – Matte orange red. Pressed pigment shadow. Very nicely pigmented, blends well and minimum fallout. Hop On – Matte true red. Pressed pigment shadow. 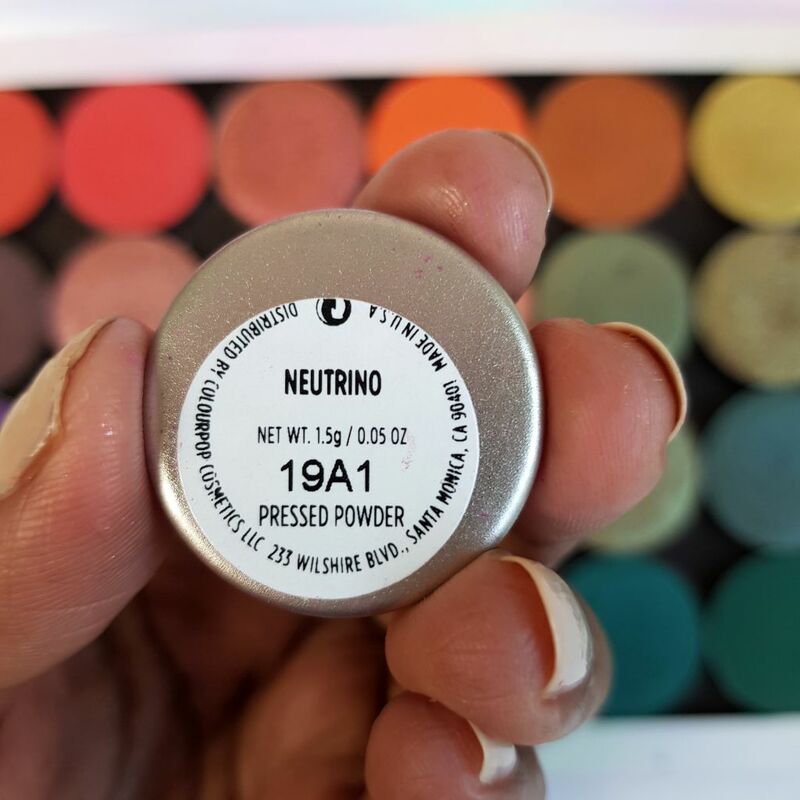 Very nicely pigmented, blends well and minimum fallout. Thank U, Next – Metallic rosy bronze with a copper duo-chrome flip. Beautiful shade, one of my favourites. Pigmentation is great but little loosely pressed in the pan so needs to be blended well. Very soft and smooth texture. Bratty – Matte vivid orange. Pressed Powder Shadow. Blends amazingly, need to be built up on my skin tone. Great pigmentation. Crackle – Metallic pumpkin spice orange. Warm shimmer shade. Very smooth and intense. Hung Up – Blackened purple. Its a smooth shimmer shade with a satin feel. Very good colour payoff and one of my favourites. Will be great for smoky eyes. Misty – Metallic pinky rose gold with baby blue glitter. A little loosely pressed in the pan but very easy to blend. Smooth pigmentation. Mr. Sandman – Icy rose with a silver sheen. Very unique shade and will highly recommend. Super smooth and intense. 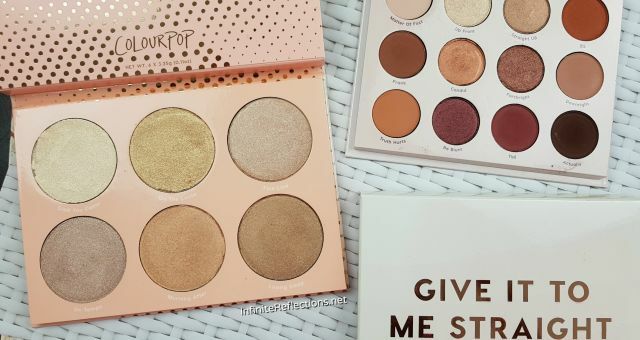 Over It – Metallic peach with a gold flip. Another shimmer with satin feel. Very smooth texture and will be great for soft peachy looks. 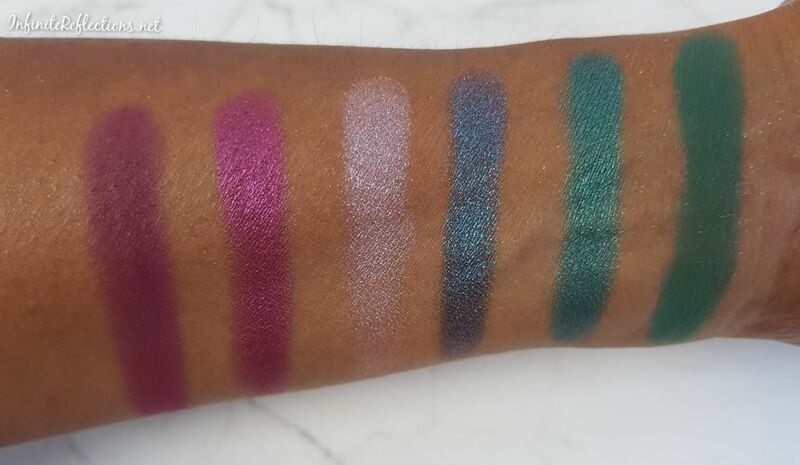 Sideline – Duochrome eggplant with a green flip. It seems more green to me than eggplant but beautiful texture. Unique shade again. Baby Lights – Metallic green gold. Beautiful sparkly gold green shade. Will highly recommend this unique gold. Try Me – Matte deep violet. Pressed Pigment. Excellent pigmentation and colour payoff. Blends like a dream. Neutrino – Metallic purple with a blue sheen. Another favourite in the palette. Very smooth texture and applies beautifully. Very easy to work with. Solstice With The Mostest – metallic neon pink with a blue sheen. A decent bright shade. On my skintone, it needs to be built up but the colour payoff is good. Glass Bull – Duo-chrome lavender icy-blue. Another unique shade. Do not pass on this one if you like lavender duo-chromes. Amazing quality. Tea Garden – Duo-chrome red with a green gold flip. It has been described as a duo-chrome red but I don’t see a lot of red. Nevertheless, this is also a very unique shade and one of my favourite kind. Very pretty duo-chrome. Smooth in texture and good colour payoff. Wishful Winking – Metallic teal with an eggplant duo-chrome. Another gem. The formula is consistent with the other duo-chromes. If you like to do smoky looks with a twist, then this shade is great. Sleeper – Matte eggplant. 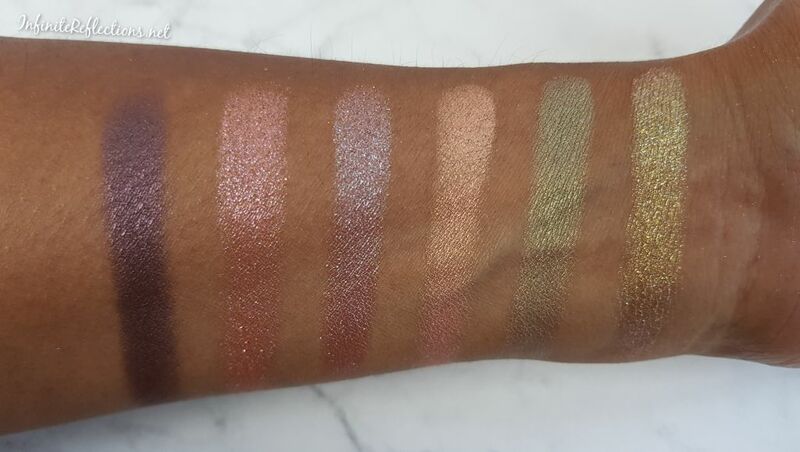 Pressed pigment shadow. Excellent pigmentation and colour payoff. Blends decently. Paradiso – Metallic violet. Smooth and Intense shimmer. 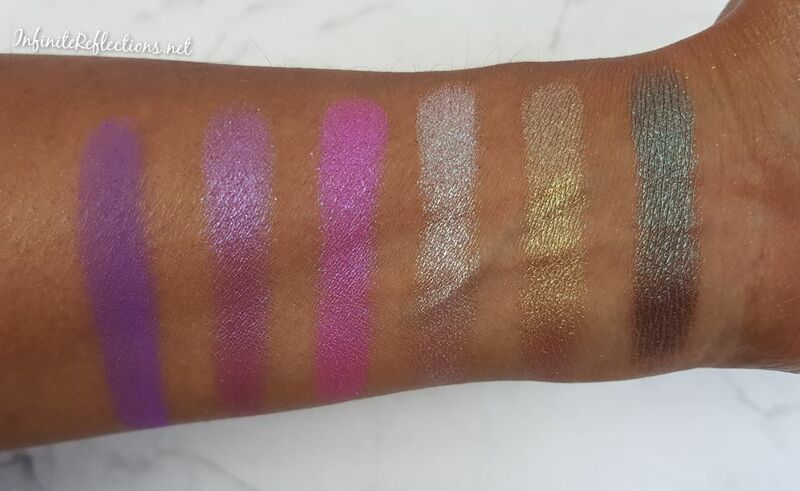 Earthshine – Pinky lavender with a blue duo-chrome flip. Very soft and subtle duo-chrome. Good pigmentation and very smooth. Antimatter – Metallic turquoise with a deep purple duo-chrome. This is another favourite in the palette. A beautiful blue with a deep base. 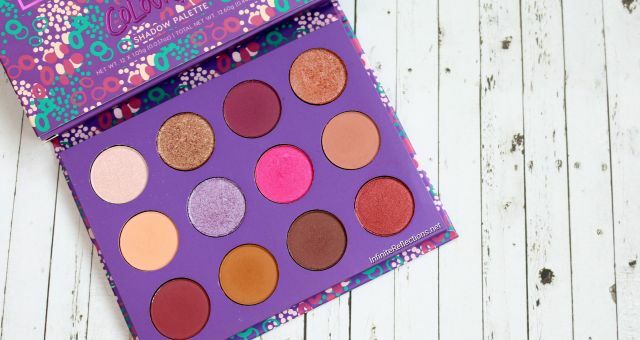 It is very close to one of the Dose of Colors block party single shadows. Similar look and feel at a fraction of the cost. Superzoom – Metallic teal. Smooth, intense and excellent pigmentation. Conjour Up – Matte emerald. Pressed powder shadow. Very good pigmentation and colour payoff is amazing. Doesn’t need to be built up too much on even my skin tone. Easy to blend. So, those are the shades I purchased and I very happy with them. Honestly, I don’t know if I need to buy more eyeshadow palettes. These shadows consists of colours I wear all the time. 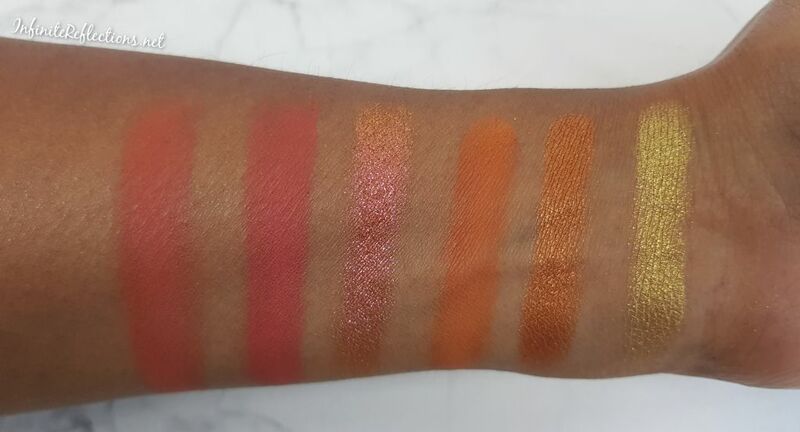 I hope the swatches were helpful. Thanks so much 🙂 Loving my BYOP.. definitely worth it!